Washington: George Herbert Walker Bush was a gentleman hero, a shrewd diplomat, a rich man who walked with grace and privacy through a world of fears at a moment in history when the Cold War crumbled and America’s might and confidence were quickly challenged by gathering dangers at home and abroad that would undo his presidency. The news of his death last Friday spurred an outpouring of condolences and reminiscences from across the nation and around the globe in tribute to his decades of public service, steely pragmatism and unpretentious manner. 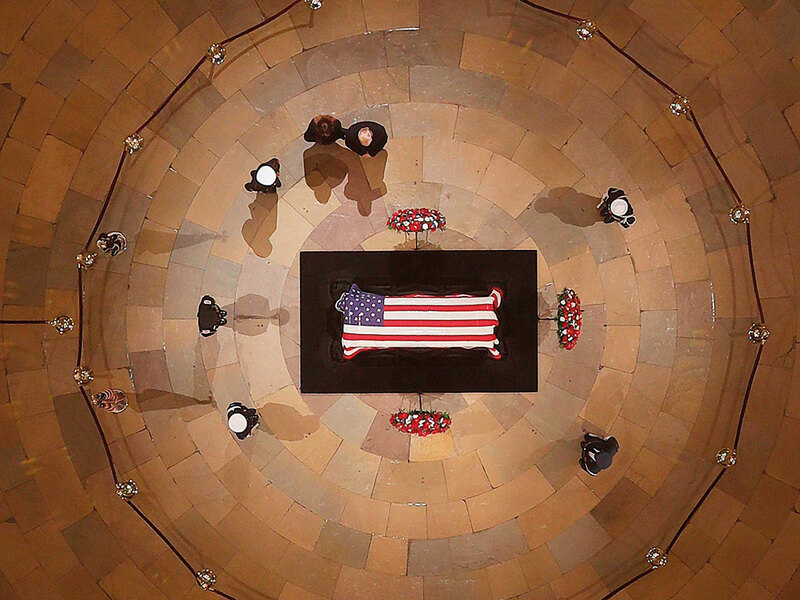 The historic and ornate United States Capitol Rotunda hosted mourners on Monday, paying respects to the 41st US president, who will be buried on Wednesday in his home state of Texas. A casket bearing Bush’s body arrived on the Capitol grounds at sunset on Monday for a ceremony led by congressional leaders who celebrated the life of the Republican president and father of the 43rd president, George W. Bush. The public was given 36 hours to file past the elder Bush’s flag-draped coffin. later today, it will be transported to the Washington National Cathedral for a memorial service. Senate Majority Leader Mitch McConnell opened a session of the Senate heralding the “daring” Second World War aviator, former head of the Central Intelligence Agency and wartime president. “Year after year, post after post, George Bush stayed the course,” McConnell said. Bush was quickly lauded for his decades of public service, loyalty to loved ones and unflinching sense of civic duty. But his decency and compassion often played out subtly and behind the scenes, with his letters offering the most intimate glimpse of the president. US President Donald Trump designated yesterday as a national day of mourning, putting aside a long-running feud with the Bush family and praising the former president for having “led a long, successful and beautiful life”. German Chancellor Angela Merkel said her nation “is deeply indebted to George H.W. Bush”. The former president was revered in Germany for supporting the reunification of East and West after the collapse of the Soviet Union. Bush was a blue blood with quirky charm and a sharp temper, the scion of an age when the truisms of the Second World War confronted a long Cold War, the aggression of Saddam Hussain, the rise of terrorism, the spectre of a troubled economy and the rancorous political divisions that would see Trump rise to the pinnacle of Republican Party. Bush embodied the ideals and stoicism of a nation. His Navy plane was shot down in the Second World War, but not before he had delivered its bombs. He served two terms as vice-president under president Ronald Reagan that ushered in a new conservatism, which would help elect Bush president in 1988 and witness the fall of the Berlin Wall. Reactions to his death spoke to his patriotism and a sober world view honed by his time in the intelligence realm and as president, when in 1990-91, he sent US forces to the Middle East to defend Kuwait against Iraq’s army. But his inability to resonate with voters and his aloofness to the faltering US economy cost him reelection. Former Soviet leader Mikhail Gorbachev said that he and Bush “had a chance to work together during the years of tremendous changes. It was a dramatic time that demanded great responsibility from everyone. The result was an end to the Cold War and the nuclear arms race”. President George H.W. Bush said a lot with socks. A visit from friend and fellow former president, Bill Clinton, inspired him to wear a pair emblazoned with Clinton’s face. He wore Houston Texans’ socks when meeting with the head coach. At the funeral for his wife, Barbara Bush, he wore socks featuring books as a tribute to her work promoting literacy. Bush, a Second World War navy pilot, will be buried wearing socks featuring jets flying in formation — a tribute to the former president’s lifetime of service. The mayor of Houston urged people attending a City Hall tribute to Bush to wear colourful socks in memory of the former president.